On the one side: The iPad. On the other: The upcoming HP, LG and BlackBerry tablets, each having its praises sung loudly, and each to a different tune. On the one side: The iPad. 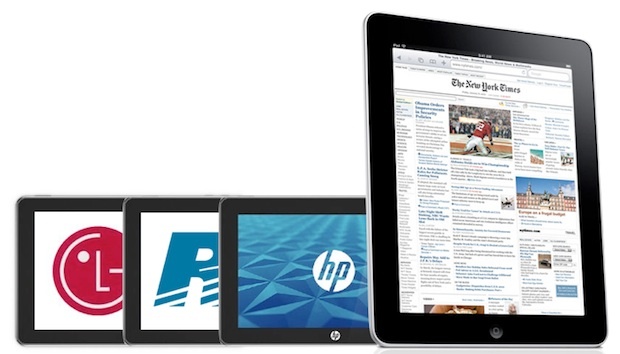 On the other: The upcoming HP, LG, and BlackBerry tablets, each having its praises sung loudly, and each to a different tune–so that it stands apart from Apple’s million-selling runaway success. People have been pondering what HP’s tablet PC strategy will be after its first effort got a glitzy show-and-tell by Microsot’s Steve Ballmer himself, before being indefinitely delayed. With HP’s surprise purchase of the ailing Palm–and the subsequent talent flight from among Palm’s top team–the mystery deepened. Now Todd Bradley, head of HP Personal Systems Group, has said “You’ll see us with a Microsoft product out in the near future, and a webOS-based product in early 2011.” That’s a direct confirmation that HP will be using Windows 7 in a slate PC as well as a Palm-based system. Windows 7 is, according to Microsoft, ready to be integrated into touchscreen computers straight away, but the more relaxed timescale for the Palm-based device suggests HP is having to tweak webOS to run on tablets–perhaps to maximize the sort of performance you can get from it. The two-tone strategy from HP is interesting, though. It suggests that neither webOS or Windows 7 tablets represent an absolutely ideal tablet operating system, and HP’s running with both so it can cover all the bases. It’s also an effort to capture those consumers who are anti-Apple, and pro-MS or pro-Palm … an audience it makes sense to appeal to, as it seems the average Joe Public (who doesn’t particularly care about an OS flavor) is buying iPads as fast as Apple can make them. While HP struggles to build an MS-powered tablet that runs a “full” desktop operating system (albeit one that’s been squeezed and manipulated and tweaked and band-aided to run on a touchscreen) on a tablet, alongside a tablet running on an up-rated smartphone OS, BlackBerry is also planning a tablet. When this news hit, the natural assumption was that RIM would take the core of its latest and greatest (iPhone-est) operating system BlackBerryOS6 and polish it up to run on the rumored BlackPad. But now there’s news that a different strategy may be in action. Back in April, RIM bought QNX Software Systems which makes software running inside the dedicated computers in car entertainment units, nav units, and so on, as well as military hardware. The current hot rumor is that QNX is building a new OS for the BlackPad, since this obviates having to deal with legacy BlackBerry code in the operating system, and could allow existing third-party QNX developers to put apps together for the device. This, if true, is a bold move for RIM. In one step it would squash many of the criticisms leveled at the firm’s latest smartphone offerings, which is that its operating system and user experience are looking increasingly outdated-because RIM has failed to innovate. And then we come to Android, which is possibly the most powerful challenger to Apple’s iOS devices, and an ingredient in many upcoming tablet PCs. LG will be using it inside its tablet PC, which LG is hoping will turn around its advanced mobile devices business (which has been lagging its dumphone sector). And now the head of this unit inside LG, Chang Ma, has been up-talking the device: It is going to “be better than the iPad” he thinks, since the iPad is primarily a consumption device, versus a productivity device. It’s an interesting stance, given the news that many business folk around the world are buying iPads, and the fact that there are close to 900 “productivity” apps for the iPad in Apple’s App Store, over 600 “news” apps, and over 600 dedicated “business” apps. There’s also the fact that both iOS and Android are specially designed operating systems that target mobile devices–versus the full desktop OS that would run on a Windows 7 unit, delivering familiar software like Word–so we’re wondering exactly how Ma is going to achieve his promise. LG’s PR team probably slapped a collective palm to their forehead on hearing Ma’s words, so we can expect some more carefully constructed press data on the matter at some point soon.